Chirps, bellows and notes so high they seem unnatural, that’s the northern mockingbird’s (Mimus polyglottos) chorus. The northern mockingbird holds the dual title of most common mockingbird in North America and master of mimicry --mockingbirds have the ability to mimic other bird songs and sounds nearby so precisely as to trick listeners into thinking they’re the originators. Mockingbirds are medium-sized songbirds (measuring between 8 and 10 inches long) with long legs and tails. They have short, rounded wings and small heads with long, thin bills. A mockingbird’s plumage is grayish-brown while its belly is a lighter gray or even cream color. Perhaps its most distinct physical characteristic lies on the wings. A mockingbird’s wings are adorned with white patches that flash when they fly, making them appear larger than in actuality. Northern mockingbirds inhabit all of North America from Mexico to Canada. Despite their wide range, they’re most commonly found in the southern United States. Mockingbirds prefer open areas and forest-edge habitats, and they frequent farmlands, parks, grassy thickets and even residential backyards. A mockingbird’s habitat must have a high perch, usually a tree, but can also be something man-made like a telephone pole, from which he keeps a lookout and defends his territory. Mockingbirds are omnivores. Their diet consists of insects such as beetles, ants and grasshoppers, berries like holly berries, mulberries and raspberries as well as seeds, earthworms and the occasional crustacean or small lizard. Mockingbirds forage either on the ground or in trees and shrubs, careful to avoid any predators like hawks, owls, crows and snakes. Northern mockingbirds, despite their chorus of song, are solitary, territorial birds. Aggressive during nesting season, mockingbirds have been known to attack animals much larger than themselves (like dogs and cats) in defense of their territory. 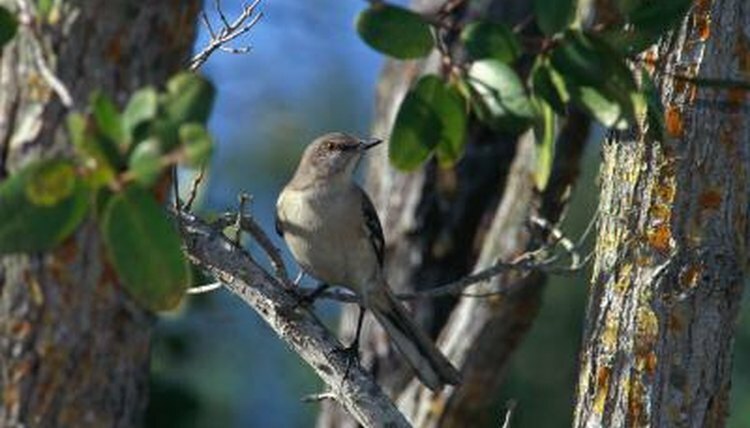 Mockingbirds in northern areas migrate south to nest, while birds in the southern range spend their lives as southern residents. Northern mockingbirds have remarkable singing abilities. They can perform at least 39 songs in addition to 50 call notes; a male mockingbird, who sings more loudly and frequently than a female, may be able to learn up to 200 songs throughout his lifetime. Mockingbirds sing throughout the day, with unmated males continuing well into the night, especially during a full moon. Mockingbirds use song to communicate, attract mates and delineate territory.